• JSA: CLASSIFIED #14 "Fast Shuffle!" • PLOT SUMMARY: Written by Steve Englehart. Art by Tom Derenick & Mark Farmer. 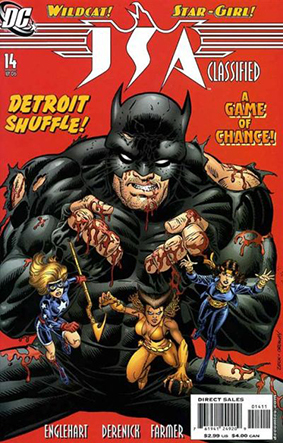 Continuing the events of JLA CLASSIFIED #25, we catch up with Amos Fortune as he teams up with the Gambler! Their first game: kidnapping Wildcat. It's up to Star Girl to rescue him, with some help from Gypsy and Vixen!